Vertical Blinds | Blinds & Decor, Inc.
Vertical blinds are the traditional choice for sliding patio doors and other large windows. With a wide variety of styles and materials including wood, faux wood, smooth PVC, plastic and fabric, custom verticals can suit almost any decor requiring a functional yet elegant window treatment solution. Whether you are looking for elegance, light control or simply to preserve a lovely view, vertical styles are the versatile solution for your homes large windows and sliding doors. If you’re just seeking replacement slats or vanes, we can assist you. We cater to all of the Bay Area and the surrounding cities. CALL or E-MAIL us now to schedule a Free Consultation! Our custom faux wood vertical blinds, otherwise known as Vertical Plastic Blinds and Composite PVC Blinds, give you the same look as a real wood variation with the easy upkeep of PVC. These blinds are very durable, and don’t warp or crack due to humidity.Available in 3 1/2″ Slats and several different colors, faux wood vertical blinds make any space feel sophisticated and modern. To make your patio doors or wide windows an eccentric piece of décor, choose our custom fabric vertical blinds. We offer a great selection of fabrics and patterns, giving you the best solution available to control your privacy while adding elegance to your room. For supplemental light control, you can add our optional PVC backing – making them greatly efficient for those large glass sliding and patio doors. 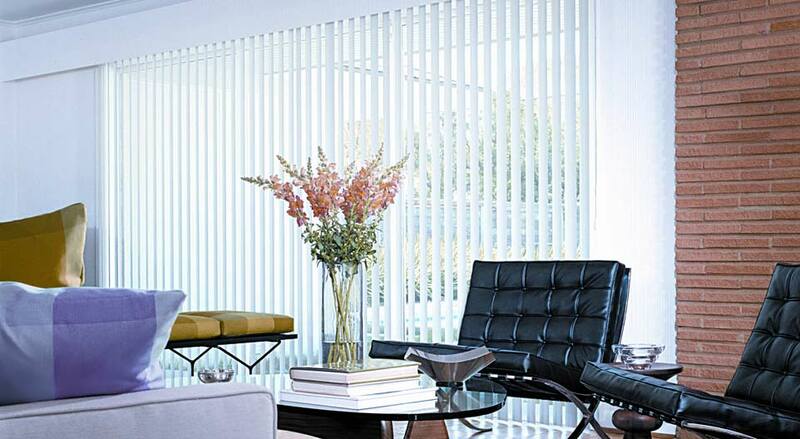 Our smooth and textured vertical blinds offer superior light-blocking features due to the curved shape of its slats. This curved shape creates a sealed closure, which helps prevents any light from entering into the room. 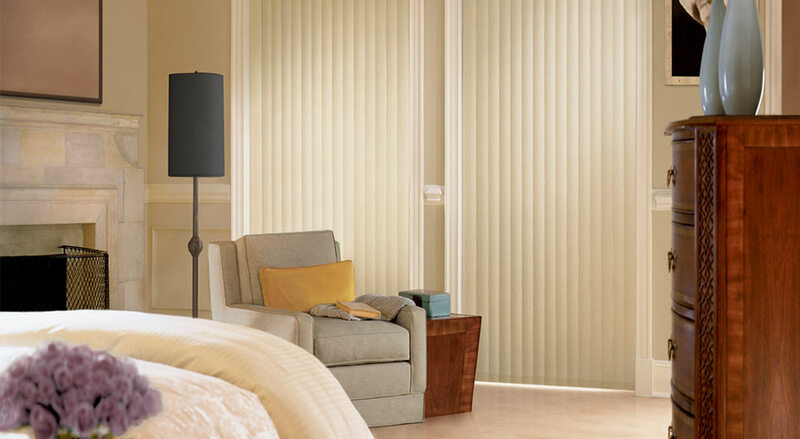 This Vertical Blind also creates perfect privacy and gives your patio door or sliding glass doors an elegant look. 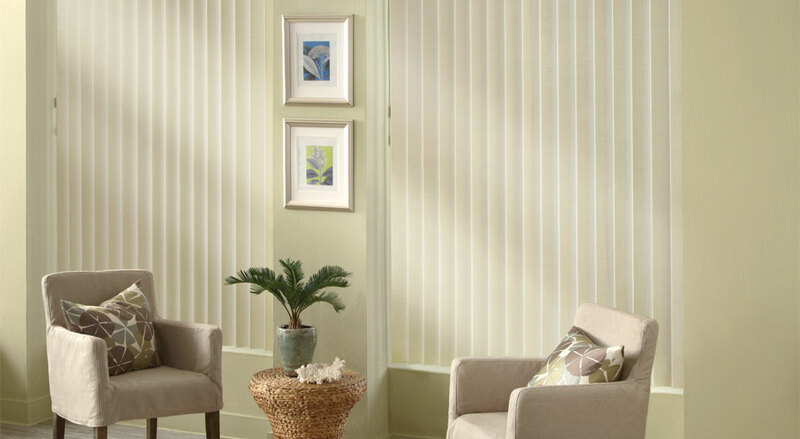 Available in 3 1/2” slats and a wide selection of colors including shades of white and textures, these blinds will be a stunning addition to any room. Our custom wooden vertical blinds are crafted out of beautiful Basswood, making them lightweight yet very durable. Vertical wood blinds add a sleek, contemporary styling to any room.These 3 1/2″ blinds are available several different stains and shades of white.